Coach Terry “Chino” Chinnery, bottom left, kneeling, and his Power Outage squad, gave him his first Men’s Softball title. Terry “Chino” Chinnery has pulled off a rare softball feat that hasn’t happened in 38 years. But, he waited and sweated to do it and it’s a birthday present he’ll definitely savor. 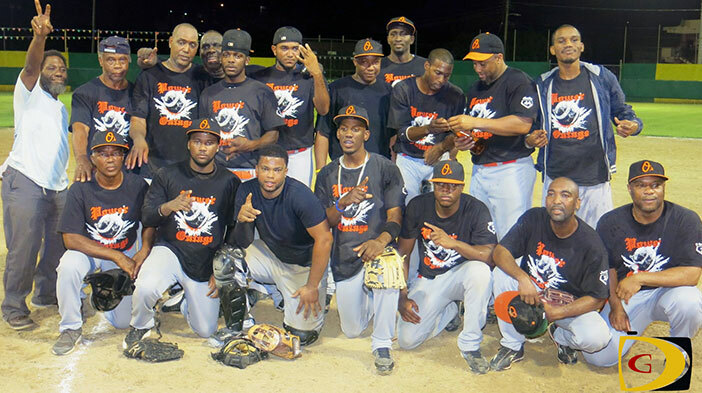 After a month’s suspense that saw his Power Outage team blowing a 3-0 lead to the Pirates and forcing a Game 7 in the BVI Softball Association Berth “Big Man” Henley League Men’s Championships Series, he was rewarded with the 2014 title on Friday night. Power Outage’s thrilling 6-5 victory over the Pirates after trailing 4-0 early in the contest—which was lengthened by the August Festival break—also gave him first men’s title. With his Pythons team already sweeping the women’s crown from the Hawks to cap off a 59 game winning streak last month, Chinnery became the first Coach to win both men’s and women’s titles since Arnold “Foxy” Barronville last pulled off the feat in 1976 with the Astros and Rivals. His team also collected $1000 from Sports Minister Myron Walwyn and the league’s trophy. Rhodni Skelton who tripled in his first at bat as part of a 3-for-3 game, got his second hit and scored in the fourth cutting the deficit to 4-1. In the fifth Power Outage came up with five runs on five hits and key two Pirates’ errors to take a 6-4 lead. After getting on base in the top of the seventh, Nickos Penn advanced to third on two pass balls, then stole home when the catcher threw the ball back to the pitcher making the game 6-5, before Sheep—who at one point struck out five straight—recorded his 12th strikeout to end the game and started the wild celebration. Pirates’ ace Woodrow said they had one bad inning that killed their game.